This collection features fifty color photographs—each a canine character in disguise along with a brief biography on the facing page—from Lady Gaga to Saint Nicholas, offering early readers and their families a delightful way to learn about remarkable lives. The photographs were made at the Halloween Dog Parade, held annually at New York City’s Tompkins Square Park. The parade originated in 1990, when dog owners in the Lower East Side needed an official space for their dogs to run freely. Residents petitioned the city and were granted permission, provided they manage and fully fund the designated area. Volunteers then banded together and organized a dog parade as a fund raiser; the ensuing space became the first New York City public area where dogs were allowed to run freely without a leash. These lighthearted photographs show how a determined community gained immeasurable pleasure while working towards a common cause. By means of the Halloween Dog Parade, canines adopted personas of refugees, saints, villains, and superheroes. In 2005, attendance numbered more than 2,000 spectators who watched dogs masquerade as inmates, princesses, samurai, policemen, entertainers, socialites, and Siamese twins. I hope that learning about these personalities will ignite interest in children to further explore a chosen character. 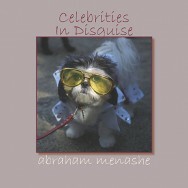 The book is also intended to spur family discussions about these (not always endearing) celebrities, about being true to oneself and what it means to find one’s true calling. Celebrities In Disguise, by Abraham Menashe, available from iTunes. ←Older: What do you take for granted?